When you are planning your trip to Los Angeles, California, it is helpful to know that there is a comprehensive system of public transportation available in the area. Knowing how to navigate the Los Angeles Metro can help you to explore the sprawling city and other areas in Los Angeles County. The Los Angeles County MTA (Metropolitan Transit Authority) operates underground and above-ground trains as well as buses in Los Angeles County known as the Metro (not to be confused with the Metrolink between-city computer trains). These are county services, and there are more than 15 municipal transit services that also operate within the county. The Metro Trip Planner is helpful if you know your starting and ending Metro stations. The Green Line goes east from near LAX connecting with the Blue Line in central LA and on to Norwalk (where you can catch a bus to Disneyland). The Blue Line runs from Long Beach to Downtown LA and the Red Line. The Red Line runs from Union Station through downtown and up through Hollywood to North Hollywood. The Purple Line runs from Union Station along the same line as the Red Line ​but diverts at Wilshire and Vermont to continue along Wilshire for a couple stops. The Gold Line runs from Union Station northeast to Pasadena. The Expo Line runs from the 7th St/Metro Center Station in Downtown LA, where it meets the Red and Blue lines, west through Exposition Park to Culver City and on to Santa Monica. The Metro Orange Line (through the San Fernando Valley) and Wilshire Rapid Express (Bus 720 from downtown to Santa Monica Pier) are express buses that operate on proposed future train routes. They show up as thinner orange and purple lines on Metro train maps. Additional Metro buses extend routes from Metro stations to areas not reached by the trains. Other local transit systems also have buses that serve Metro stations. Metro has transitioned from tickets to TAP cards for all trains. All fares must be loaded onto plastic TAP cards, and then tapped on the TAP box at each station to validate. The reusable TAP card costs $1 in machines or on buses, or $2 from vendors, in addition to whatever fares are loaded onto it. The card must be tapped for each train or bus that you board along your route. Metro trains and buses in the same direction within two hours are now included in the base fare as long as you use the TAP card and tap the final transfer within the two-hour window. However, if you pay cash to board a Metro bus (the only place you can use cash), no transfers are included. There are many different fare rates including single base fare, senior/disabled/Medicare fare, day passes, weekly passes, 30-day passes, Metro to Muni supplements, and zone charges. Pass holders without a Zone Stamp (extra when you buy the pass), can pay the zone charges in cash or from stored value on the TAP card. The Zone and Premium charges are really convoluted. Most visitors won't need them, but you can check here for more info. The Metro Silver Line buses that run primarily on freeways from the Southbay and San Gabriel Valley to Downtown LA landmarks require a supplemental fee. LADOT (Los Angeles Department of Transportation) offers bus service within the city of Los Angeles and connects to the bus systems of surrounding cities and to Metro buses. 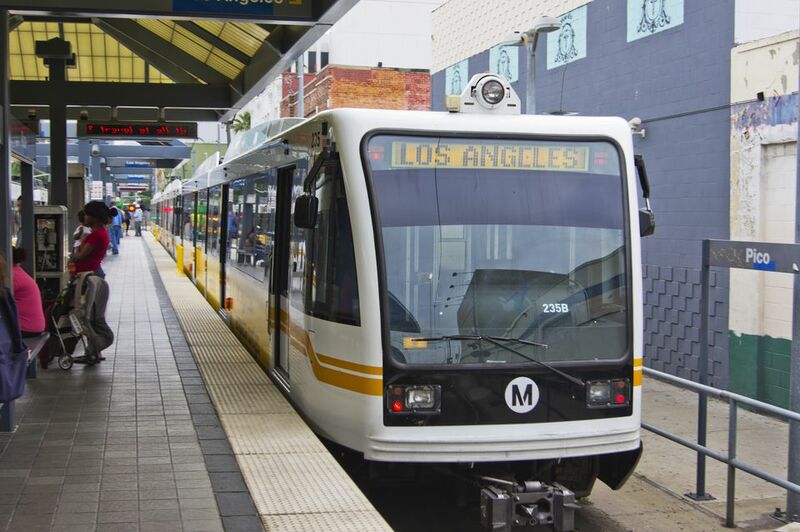 LADOT runs the DASH system, the Commuter Express, and the San Pedro Trolley system as well as City Hall and Metrolink shuttles Downtown. LADOT also operates a weekend shuttle to the Griffith Observatory. Santa Monica’s Big Blue Bus system serves the Santa Monica and Venice area with lines extending to adjacent cities. Long Beach Transit serves the Greater Long Beach area and includes the Aquabus and Aqualink boat services between waterfront attractions during the summer and weekends the rest of the year. The free purple Pine Avenue Link runs along Pine Avenue from Eighth Street to Ocean and connects to the Aquabus and Aqualink. The red Passport buses are free within the downtown area and to the Queen Mary, but require a fee to Belmont Shore.